Great North Run places are running out! Each year we have a team of ‘Great North Runners’ who lace up their shoes and pound the pavements in preparation for the UK’s most popular Half Marathon. 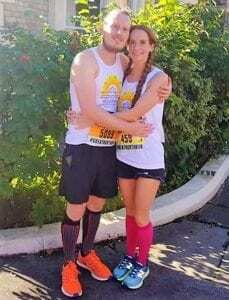 Husband and wife team Natalie McCarron and Martin ran the Great North Run in 2018. It was Martin’s first time running in an event. They raised a wonderful £700 to support our charity. Thank you so much! If you missed out on the ballot for Great North Run tickets and would like to fundraise for Hospice at Home West Cumbria then get in touch with our team today…we have just a few places left. The run will take place on Sunday 8th September. Entry fee is £65 per person. We ask for a minimum sponsorship amount of £250 to be raised to support our work. If you would like to secure a place and support Hospice at Home West Cumbria please contact the Fundraising Team for more information.